See Fantasy Chess Enthusiasm on YouTube. Follow a Fantasy Chess game play Battle Report on YouTube. Read and see a Fantasy Chess game, Click on the above link. This report is done up in a narrative describing the battle between Keeng of the Red Orcs and KingSir of the Blue Humans. If you would like to read and see a Fantasy Chess game, Click on the above link. This report is done up in a narrative describing the battle between Keeng of the Red Orcs and KingSir of the Blue Humans. Fantasy Chess was demonstrated at Huzzah! Historical Wargaming in Portland Maine. Fantasy Chess was demonstrated at this event. First Place: Chad Sweetser with his King Loki of Evil Black. He was awarded a Fantasy Chess Rulebook. Second Place: Jordan Plog with his Arthur King of the Good Mongrel army. He was awarded a 32" Felt mat. Third Place: Dustin Springer with his King Donavon of the Blue Barbarians. He was awarded a set of Human figures with bases. Fantasy Chess video shoot at R Choice 2 Gaming in Portland, Maine. First Place: Dennis Faulkenham Jr. with his King Squeefoofy Snuggyball of the Gold Dwarves. He was awarded a Fantasy Chess Rulebook. Second Place: Travis Fisher with his Joudoun Zebulton of the Mongrel Black Humans. He was awarded a 32" Felt mat. 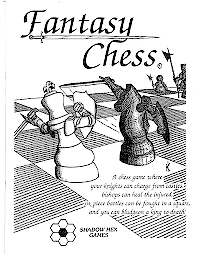 Fantasy Chess debuted on the East Coast at R Choice 2 Game in Portland Maine in April 2014. First Place: Romel Bonito again defeated his opponents with his King MiniDice of the Black Orcs. He was awarded a full game (without figures) including mat. He graciously donated this to the 2nd place winner. A true King! Second Place: Ezra Behnen with his King Cratos of the Gold Dwarves. We skipped the tournament this time and played a 4player game. First Place: Jim Lucas of the Blue Elves. Second Place: Travis Cheney or the Red Orcs. Third Place: Robert Hall of the Black Orcs. He also won the raffle for a full Fantasy Chess game (without figures) including mat. First Place: Romel Bonito with his King MiniDice of the Black Orcs. He was awarded a full game (without figures) including mat. Second Place: Travis Cheney with his Sir Awesome of the Gold Dwarves. He was awarded a Fantasy Chess Rulebook. As demonstrated at the world famous Pasadena Rose Bowl. First Place: Jack Williams with his King Henry VIII of the Black Evil. He was awarded $20. Second Place: Allan Gonzalez with his Nyan King of the White Good. He was awarded $10. First Place: Ryan Prichard with his King George III of the Black Orcs. He was awarded $20. Second Place: Jack Williams with his King Woton of the Gold Dwarves. The Fantasy Chess Tournament was interrupted by an outbreak of zombies. ZOMBIE CHESS playtesting in progress at this convention. The Fantasy Chess Tournament was won by Kevin Goudge with his Imperator of the Mongrel White Army. He was awarded $20. Second place went to Mark Ksen's Czar Aenditz of the Evil Black Legion. The Fantasy Chess Tournament was won by Andrew Stuh with his Sir Awsome of the Gold Dwarves. He awarded $20. Second place went to Daniel Watson, who's King Sir Awsome Can'Suckit of the Black Orcs held out to the very end. Thank you all who came to the Demos and Tournaments. Thank Andrew, Daniel, Michael and John Paul for playing Four Player Fantasy Chess. First Place: Ben Tobin with his King Thol of the Black Orcs. He was awarded $20. Second Place: Alex Sharp with his King Beersoaked Beard On Legs of the Gold Dwarves. Where the logic of tactics and the excitement of battle meet! Fantasy Chess was at Gateway 2011 Game Convention. Here are some photos.